Watershed conservation. Climate change. Ocean acidification. 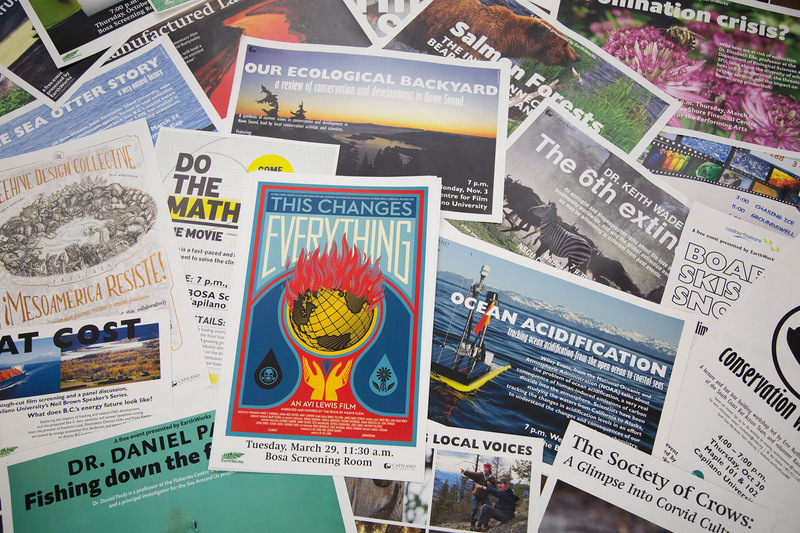 Spread over the table are dozens of posters from EarthWorks, Capilano University’s public lecture, film and event series that explores environmental issues from a multidisciplinary perspective. Leafing through the colourful posters, longtime EarthWorks committee member and geography instructor, Cheryl Schreader recalls how the EarthWorks series got started. It was the fall of 2011 and the catalyst was Tiare Jung, a passionate Liberal Studies student. So she brought together instructors, staff and students from across disciplines for a dialogue to explore the possibilities. In less than a month, the EarthWorks series was born. From its launch in January 2012, the series has inspired the campus community and beyond to take action to make positive change. The series has explored everything from the plight of bees to the symbiotic relationship between bears and salmon, and has influenced the University’s curriculum as well, with many topics being explored further in the classroom, deepening the learning.